Pictures do not do justice to the actual hue of green of the truck. You pretty much have to experience it. In fact, I’d be happy to show it to you if you are ever in the valley. I chose to put the truck on the label for two reasons. For one, I think the wine world takes itself just a wee bit too seriously at times; the heart and soul of wine is not kings, culture, and the four-star dining room table; it is the farmer (and the farmer’s truck). Secondly, the label pays homage to a particular green ’66 Ford Truck willed me by my grandfather, a farmer from Kansas, where I too was born. For a much more detailed story on the latter, read on (warning: stay away if you dislike sappy—but true!—love stories about grandparents). My grandmother told me this story over Subway sandwiches, with the green truck parked outside the window, when I went back to Kansas to retrieve the truck to help with my vineyard work. It so happens that I was trying to conjure up a name and label for my wine and winery about this same time. 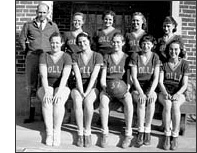 My grandmother Mary was born in southwestern Kansas, the town of Rolla (pop. 200) to be exact. When she was a mature woman of sixteen, her mother, a staunch Catholic, arranged a date for her. The only catch was that the “fella” was in Fredonia, Kansas (pop 2000; the big city) in the southeastern part of the state. So, Mary--at the strong urging of her mother--packed up one summer and traveled over to Fredonia to meet her arranged date. Thing was, communication then not being what it is now, the fella wasn’t even in Fredonia when she arrived; he was still out on the wheat harvest loop, which at that time took young men away for months at a stretch, traveling with the maturity of the crop from Oklahoma to Colorado to Nebraska and to Kansas. The fella’s parents, not feeling it proper for a young girl to be about town by herself, assigned her a chaperone for the time being, a close friend of the family. That chaperone’s name was Loren. He would become my grandfather. Over the next four weeks, Mary and Loren got “hot and heavy,” as my grandmother put it. Then suddenly, Loren and Mary heard word one day that the original fella was on his way home. Not wanting to face the whole situation, Mary and Loren agreed that Mary would head back to Rolla, and they would write to each other every day until they figured out what to do next. Upon arriving home, Mary wrote one letter and sent if off. She then wrote a second letter the next day. She continued writing for the first week, but never did a single letter come in return from Loren. “I gave up,” says Mary. “And I started dating a fine guy named Owen.” Owen will creep back into the story later. So one Saturday night a few weeks later, Mary is up in her room getting ready for a date with Owen when suddenly she hears rocks at the window. She opens the shutters, looks down, and who is standing there? “I came to do what I said I was going to do,” Loren says. “What are you talking about?” Mary answers. And come down she did. Turned out that in that very first letter he wrote, Loren mentioned that he was coming west for a Methodist church camp, and he was going to stop by to see Mary. Mary thought about it, and put it together (and it was later confirmed). Mary’s mother had intercepted the letters, and being a staunch Catholic and all, her mother had decided that Mary didn’t need to be reading no letters from no Methodist. Not a single letter had ever gotten through. As a side note, Mary never spoke to her mother again. That’s how my grandparents got married. That very night. And because my grandfather was about to go away on a harvest loop himself, they rushed back to Fredonia. They moved in with Loren’s parents the next day. My grandparents were married in 1937 and stayed in Fredonia for the rest of their lives together. 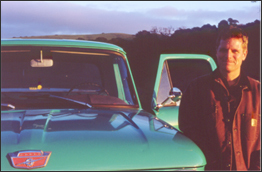 They bought the green Ford pickup new from Shawnee Ford in 1966. They went on their honeymoon, in the truck, to Niagra falls in 1982. Grandpa died in 1986, willing the truck to me, and I’ve been driving it hard ever since.